Septic systems are often put on the back burner of a homeowner’s mind. However, these systems are the unsung heroes for people all over the continental U.S. as a vital part of every day life. When something starts to go wrong with the septic system, it can be hazardous to the health of you and your family if left to fester. This article will go over some of the most common septic system problems, causes and possible solutions. This is probably the most obvious sign that something is wrong with your septic system. The most common cause is that the tank hasn’t been pumped for quite some time. Without routine pumping, the solids in septic tanks will build up and can reduce the tanks holding capacity. Another reason they might back up is improper disposal of household products. These products include: grease, gauze, diapers, excessive toilet paper, paper towels, feminine products, the list goes on. Another reason for a backup is that your septic tank filters are clogged. The tank filters protect your drain field, keeping it from being overloaded with solids. Thankfully, all you have to do is pull out the filter and hose it off with your garden hose. Keep an eye out for any problems with the filter, or have a professional come and clean the filter. In order to avoid a clogged or backed up system, make sure to watch what substances are going down the pipes. Make sure you have your septic tank pumped regularly to keep it in pristine condition. 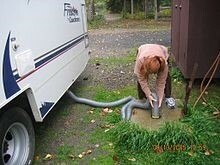 This is another common problem with septic tanks, especially as they are not routinely maintained. Tree roots are naturally attracted to the moist, nutrient dense waste that is held in the septic tanks and lines. Tree roots will slowly work their way around the tank and lines, looking for leaking fissures or holes. Once they find these weak spots, they creep into the system and expand the holes, which create problems, like backups. Reputable plumbers will take into account the locations of trees on your property when installing your septic system. However, tree roots can make their way far from its main body. There are chemicals that you can flush or wash down your drains that will help keep roots away from your septic system. There are also root barriers, made from plastic or other materials, that are buried around the septic system to keep roots from reaching it. The best way to make sure that roots to infiltrate your septic system is with routine “check-ups” and maintenance. One thing that homeowners might forget when doing a home project, is to locate their septic tank and drain field. 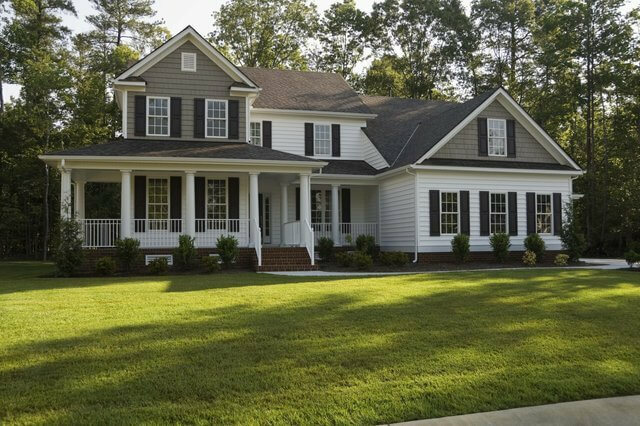 If you are doing a home improvement project in your yard, and you have a septic system, you don’t want to start digging until you know the locations of the lines and tank. Homeowners can do this easily enough by calling in a locate technician. 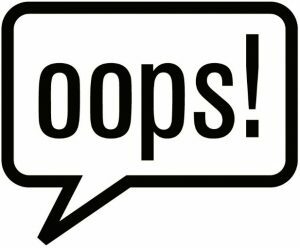 However, even with locates, accidents still happen sometimes, causing damage to your septic system. If you plan on doing any excavating soon, ask your plumbers to mark the locations as best they can, or call and have a locator do it for you. Another obvious sign that there is a problem with your septic system is a distinct sewage smell lingering in your home. 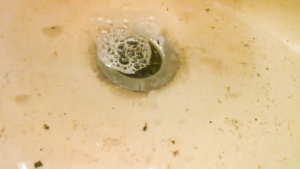 This problem typically is an indicator that there is a clog in the septic system ventilation. The best thing to do when you notice this is call and have your plumber come clean out the vent. This will help avoid the gas buildup in your home. 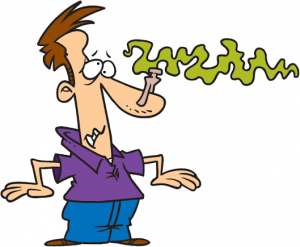 So, if you notice a smelly aroma, backed up sewage in your home, slow draining or you’re worried your tree roots might cause problems in your future, call us today so we can come make sure your septic system is set up for success! In the age of “DIY” this and “fix it yourself” that, your septic system is no exception to this fad. The question is, should you try and DIY it or should you have a professional come and look at it? The short answer: hire a professional. In this article, we will look at three reasons you should hire a professional to diagnose and repair your septic system. One of our biggest concerns for our customers is their health and safety when it comes to septic systems. Septic tanks, by their very nature, are a hazardous waste risk when not working properly. If your tank is leaking or backed-up, waste and bacteria from inside the tank can leach into your ground or back up into your drains. The contents of your septic tank really qualify as hazardous waste, so you don’t want expose yourself or your family to those kind of problems. Another reason why DIY is not recommended for septic systems, is the great potential for further complicating the problem. In our experience, most DIY septic tank projects end up making the problem worse. Despite their simple design, septic systems can have complex problems. We’ve seen too many septic systems damaged beyond repair by well-meaning, eager DIY-ers. DIY for septic systems often ends in a misdiagnosis of the problem. While leaks are generally simple to locate in most cases, clogs can be much more difficult. Often problems with your tank and drain field will be very hard to diagnose or even notice until it’s far too late. Probably one of the biggest obstacles for DIY’ers is the fact that they don’t have the right equipment. Depending on the type of problem you’re having, you might need a variety of different, specialized equipment. 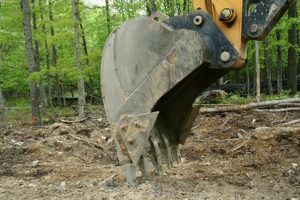 Most folks don’t have septic system snaking tools lying around the shop or heavy digging machines parked in the garage. DIY for your septic system could involve purchase or rental of tools and hiring a licensed contractor to dig. Over all, the biggest disservice DIY will do to you is all the time lost. By the time you identify the problem, acquire the proper tools and equipment, make the repairs, and clean up you will have invested hours, if not days. Time you could have spent doing something much more enjoyable. A professional can have the problem resolved much more quickly and efficiently, saving you time and frustration. Drain cleaning, septic tank repairs, drain field repairs and anything else revolving around your septic system pose serious health risks for homeowners. Theses jobs will also be nearly impossible to complete without the training, tools and equipment. Proper care of your septic system is going to cost time and money. Our goal is to make sure that your time and money is not wasted by trying to do it yourself. Avoid potential health and safety risks and the loss of money and time trying to fix your septic system problem. Contact us today! We will make sure your septic system is in the best condition so you don’t have to worry about DIYing your way into bigger problems. 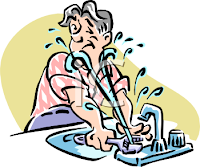 One of the unsung, often forgotten heroes of every home is the plumbing. Whether it’s a sewer system or a septic tank system, the plumbing in your house is a vital part of your everyday life. From washing dishes, to bathing children and pets, to doing the laundry, all these things require a pristine plumbing system. How do you know when something just isn’t quite right with your plumbing system? What are some signs to look for that indicate something might be wrong? In this article, we will talk about some common problems with your septic system, what might be causing them and what needs to be done to fix them. However, before we get into the article remember this: regular septic tank cleanings will go a long way in preserving and maintaining your system. Probably the most obvious sign that your septic tank needs attention is pooling water. When you see pools of water on the lawn around the septic system drain field, its very possible that your septic tank is overflowing. When septic tanks get full, solid waste could be clogging drain fields pipe system, forcing the fluid to the top of the ground. This is a clear indicator that your septic tank needs to be pumped. In contrast to the flooded lawn, an uncharacteristically healthy lawn is also a sign for concern. 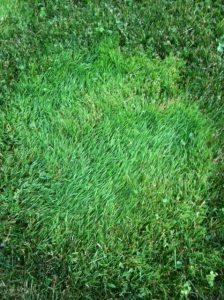 Just because there is a septic tank beneath part of your lawn, doesn’t mean that there should be any color difference from the rest of your lawn. If the grass atop your septic tank is lush and vibrant green, this could mean that your septic system is leaking water somehow. It is either full or damaged. Regardless of the cause, you need to call in the professionals. If you’ve noticed that the drains in your home have slowed considerably, this could be a clear sign that your septic tank is full. If you’ve done all the septic-tank-friendly DIY fixes to help unclog your system, then it is time to call in a professional to come and assess the situation, and most likely drain your septic tank. It might sound redundant, but the solution to most septic tank issues is to have it pumped. A clear indication that your septic tank needs your attention is, if you start to notice an unpleasant but unmistakable odor. As mentioned before, your septic tank collects all the dirty water that you expel from your house, like baths, laundry, dishes and your toilet. All that black water is a great cocktail for a scent that nobody wants to smell. This is a great time to have someone come out and empty your septic tank before the problem gets worse. Probably the most dramatic indication of a problem is sewer backup. This is also the most dangerous symptom that your septic tank needs attention. This is the ultimate cry for help from your septic tank. When the sewage backs up it will be in your lowest drains first, then the rest of them if its not dealt with soon. If this happens to you, don’t try to clean it by yourself! This problem is a hazardous waste issue needs to be dealt with immediately by professionals with the right hazard-safe equipment. 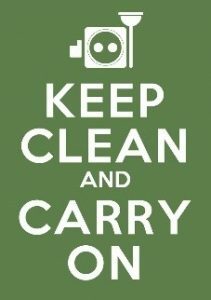 Don’t let a needy septic tank get in the way of your daily life. The best way to make sure none of these things happen to you is to have your septic tank cleaned regularly. Call us today to schedule an appointment so one of our technicians can come make sure your septic tank is getting enough attention. Sewer systems are run by the local governments, but septic systems are installed and managed by individuals on private property. The primary unit of a septic system is the septic tank. In this article, we will discuss what a septic tank is, how it works and what type of households would benefit from a septic tank rather than the traditional sewer system. A septic tank is an underground container, the major component of a septic system. 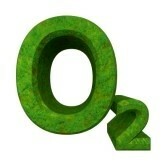 It is usually made of concrete, plastic, fiberglass or steel. 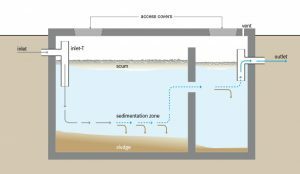 Treatment of household wastewater takes place inside the septic tank. This is a process of biological decomposition and, eventually, drainage. A septic system sees to the safe disposal of waste water. 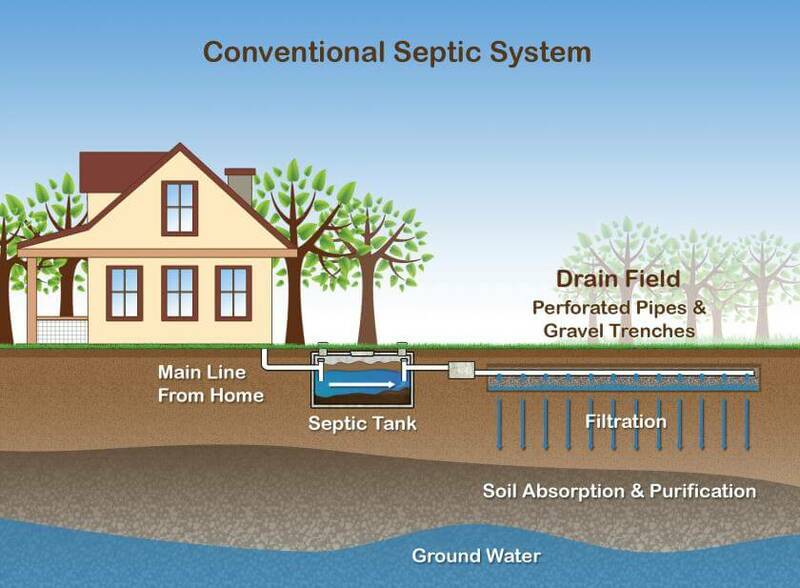 The septic system is of a basic design. This underground, watertight container is usually made in a rectangular or round shape. Your septic tank is connected to two pipes, an inlet and an outlet. The inlet pipe will collect the water waste inside the septic tank. Over time, the solid and liquid waste will separate from one another. The outlet pipe, or drain field, then carries the processed wastewater from the septic tank. 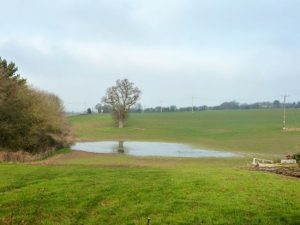 From here the water spreads evenly into the soil and watercourses. After some time has passed, three layers will begin to form: the top layer is comprised of oils and grease that floats above the waste, which is called scum. The middle layer is your wastewater with waste particles. The bottom layer is made up of heavier particles that settle down into sludge. From inside the tank, bacteria in the wastewater will begin to break down all the solid waste. The decomposition of the solid waste is very quick, which is what allows the liquids in the tank to separate and drain away easier. How Do you Maintain a Septic Tank? Making sure that you have a properly maintained septic tank is very important, not just for you, but for your property and health. Depending on the size of your septic tank, you should have it cleaned every few years. Without these regular “checkups” septic tank damage could go unnoticed, resulting in the need for a new tank. Why do I need to clean my septic tank? Toxins and antibacterial substances can build up in the tank if it is not cleaned often, resulting in the elimination of the vital bacteria that is responsible for breaking down the waste in your septic tank. Another thing to be mindful of is that a lot of household cleaners will accumulate solid waste and sludge in the drain field lines and septic tank itself. This will inevitably lead to septic system failure by blocking the system and causing overflow into the watercourse or possibly out an access grate. None of which sounds like a fun time for anyone involved. The best thing you can do as a homeowner with a septic tank is to make sure that it is in prime condition for you and your family. Whether you just bought a house that has a septic tank system, or you’re building a home with one, make sure you know the last time it was cleaned. Homes in rural areas or secluded sections of forested land would benefit most from a septic tank system. If your home is out of the hustle and bustle of the suburban lifestyle, it’s a good candidate for a septic system. Another common thing that homeowners with septic systems have is well water, these two things typically go hand in hand. 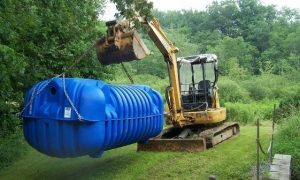 Septic tanks are becoming more popular with the younger generation ready to buy homes because they are eco-friendly and efficient. Waste that is collected from your septic tank is organic, which means you can’t send it to a landfill. The heavy sludge, however, when removed by a company that is permitted to do so, can be taken to a landfill. Another option is to have the sludge converted into fertilizers. Whether you are considering buying, building, or renting a property that has a septic tank, we can help. Give us a call today. We want to make the next step of your journey as a homeowner an easy one. The internet is rife with crazy ideas for just about any information you are searching for to meet your home care needs. A Popular Mechanics article by Roy Berendsohn tackled a question like that last year about one urban myth concerning septic tank pumping. Berendsohn said he actually spoke with people in the 1980s who had been doing the dead chicken thing, or using rotting hamburger or roadkill, to keep the job of pumping their septic tanks at bay. Unfortunately, this theory about coaxing decomposition is NOT the way to go. The rotting carcass theory has the effect of pushing harmful pollution out of one’s septic tank, through the pipes and leach field, and into the groundwater. This can represent a major hazard to your general community. Yes, pumping your septic tank is a nasty, disagreeable job, but taking care of it on a regular basis protects your property from septic system disasters, which are even more disagreeable. The real way to protect your septic system and ensure its longevity. Pipeline, the newsletter for The National Environmental Services Center, recommends these basic steps for septic system maintenance. Do you even know where your septic system is? Yes, septic system professionals can have trouble finding some systems, so don’t be shy about getting help. Knowledge is power, and a septic system professional can help you find your system components if you’re not sure where they are. 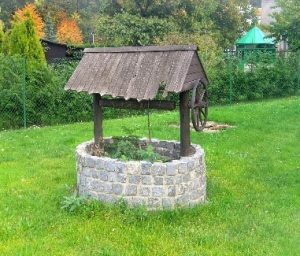 Here are three steps septic professionals may use to locate your system if there is no above-ground marker such as a septic tank riser. • A look in the basement can provide helpful information for locating your septic system such as noting the direction your sewage pipes leave your house through the wall. • When the inspector goes back outside, he can insert an insulated probe into the soil that will help locate buried pipes. 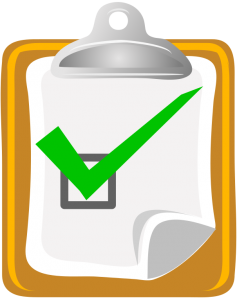 • Once your professional locates the septic system, it is important to draw a map that you can keep. This saves steps later. Your septic professional may want to take a few steps to check the pipe connections in your home. This procedure can include flushing toilets, running the washing machine for one cycle, and running water into the sinks. This will require digging if you don’t use tank risers or elevated access covers. 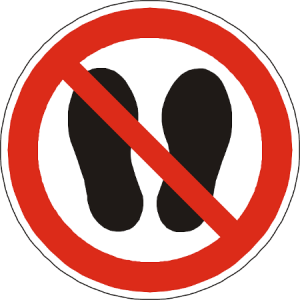 So, once you access the tank, Pipeline recommends installing one of these above-ground methods of easy tank identification. These ensure that your septic system is working properly. Additionally, a regular septic tank evaluation provides you with the information you need to know how often your septic tank should be pumped. Sludge and scum layers in your septic tank are indicators of your tank condition. Your annual inspection should include measuring the sludge and scum layers in your tank. Inspectors can do this by inserting a tool through your tank’s inspection port. Additionally, septic inspectors should check all parts of the tank to verify that there are no cracks. The Pipeline article (Pg. 2) provides a guidance chart for septic tank pumping frequency. So, don’t rely on any crazy dead chicken myths when approaching your septic system health; it’s just too important. If you feel that your knowledge about septic system maintenance and tank pumping is limited and you live in or around Knoxville, contact the experts at J & J Septic to schedule your service. You may also call them at (865) 622-4428. 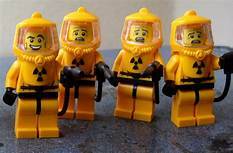 Is your Septic Tank ready for the surge of people that are coming over for the holidays? The holidays are here again, and as usual, family and friends will come to your home to celebrate the spirit of love and togetherness. As the Christmas season fast approaches, probably you’ve already begun planning Thanksgiving menus and dinners, or even preparing additional sleeping accommodations for your guests. Hosting Christmas parties at your home can easily wreak your septic system if you’re not well prepared. 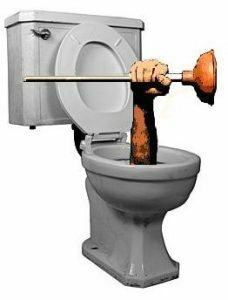 No one loves having a clogged toilet during Christmas festivities, especially with the entire family and friends around. The best approach to this festive season is to take precaution to ensure your kitchens and bathrooms run smoothly during the festive season. If you’re going to host a large family, it’s vital you make the essential preparations when it comes to your septic system to prevent incidents that may ruin your Christmas holiday. Here’s a short yet often ignored list of things to do when it comes to keeping Septic Tank ready for the Holidays. Ensure your septic tank is pumped before the holiday season. While it’s good to manage and limit water usage to avoid blockages and overfilling your Septic Pumping system, this will almost be impossible with a huge number of people around your house. Expect an increased bathroom and kitchen water use that comes with additional visitors. 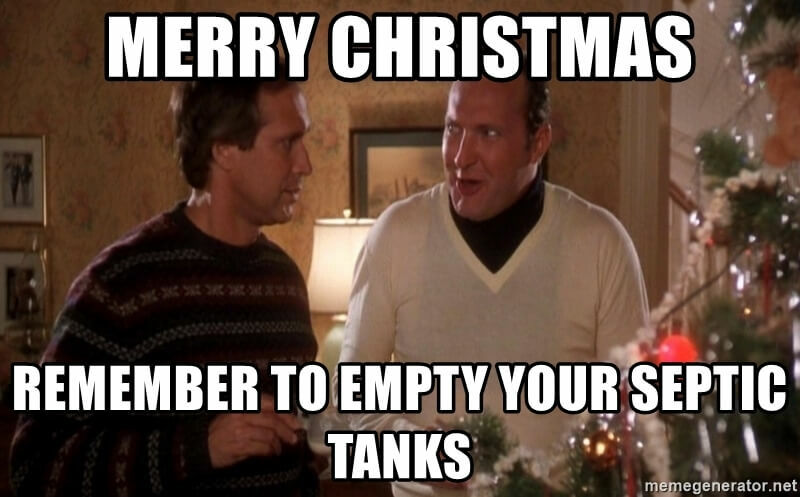 This is why you should prepare your tank by pumping it before the holidays. This hands-on approach will guarantee your septic tank won’t overflow when you need it the most. 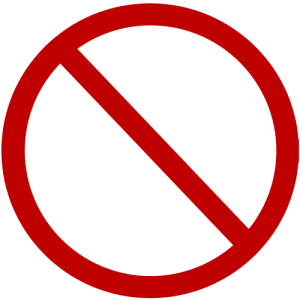 This is because most people who are connected to the main city sewer tend to flush everything down the drain, including items that are prohibited from septic systems. This includes washing trash and hard foods down the drain, emptying any kitchen grease or oils down drains, flushing tampons, excessive toilet paper, sanitary napkins, wipes and diapers down the drain. These will not only damage your septic tank but may also block your drainage system. Instead of washing these items down the toilet or sink, place them in the compost or garbage bag. Even if you own a garbage disposal system, you shouldn’t wash hard food down the drain because they don’t break the food waste products into the required size. Educate your guests on efficient water use practices and how the septic system functions. 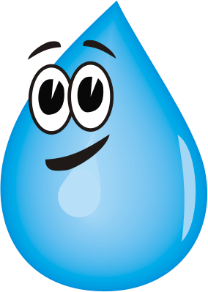 Inform them of the effects of overusing water while showering, when washing dishes and doing laundry and when using the restroom. 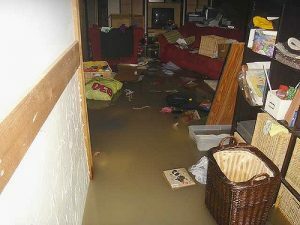 This can also cause your septic tank to overflow and backup. Lastly, you can also use an additive. This will keep your septic tank healthy throughout your festive season. Additives have natural bacteria that help in breaking down solids in your Septic Pumping. Just use one packet to keep your septic tank healthy, and you’ll be assured of a perfect holiday. Following these tips will make sure that your Septic Tank is ready for the Holidays. Also, consider hiring experts to perform checkups on your septic tank to ensure that it works efficiently.